The national convention of the Peoples Democratic Party is just a few days away. As the pioneer national chairman of the party, what do you expect from the convention? I expect a peaceful, free and fair contest at the convention. I have confidence in the chairman of the electoral panel of the convention, Mallam Adamu Ciroma. He is a seasoned politician and a leading founding member of the PDP who knows almost everything about the PDP. He knows that the PDP is a party that was founded with the intention of including everybody that is interested in joining. The PDP was formed as a party that was not divisive, that was free of rancour and hatred. But unfortunately, the party was infiltrated by some people who were full of hatred for other people. That was not the intention of the founding fathers. I want to tell you that the idea of forming the PDP was first mooted in prison by politicians who were then being incarcerated by the military after the end of the Second Republic. The idea was especially by politicians who were locked up at the Kirikiri prison in Apapa. Can you remember those of you who met at Kirikiri to discuss the prospect of forming the PDP? Adamu Ciroma, Abubakar Rimi, late Bola Ige, Alex Ekwueme, Lawal Kaita, Jim Nwobodo, late Sam Mbakwe, late Bisi Onabanjo, Mohammed Goni, Isaac Shaahu and many other politicians from the North and South of Nigeria. You people were holding political meetings in the prison? Yes, we were meeting every now and then. We worked out modalities for the formation of a party that every Nigerian would feel proud and comfortable to join. Hitherto, parties were formed on regional basis or on tribal/ethnic groupings. We felt that we should jettison those tendencies and form a party that would be all-embracing, because we realised that when parties are formed on regional and tribal bases, the soldiers could truncate a civilian government and easily play up regional and ethnic sentiments. We wanted that to stop and so decided that a truly Nigerian and democratic party that would give sincere service to the people should be formed. There are over 25 contestants for the national chairmanship position. How can the party elect one of them as chairman without rancour? That is democracy at work. They should all be allowed to test their popularity. The delegates will make their choice. They could have been over a hundred and it still would have been perfectly in order. It is democratic that they are allowed to test their popularity. There is nothing abnormal or unusual about that. Once the process is transparent, I am sure that the contestants, no matter their number, will all accept the outcome of the election. The party has already told the South-East geo-political zone to bring about a consensus chairmanship candidate. This is wrong. This is what is wrong with the present leadership of the PDP. Why should they force them to do that? Why can't the party allow them to do that on their own? Many leaders of your party have blamed former President Olusegun Obasanjo for the problems in the PDP. But, as shown by the photograph in your sitting room, it was you who encouraged Nigerians to accept Obasanjo as president in 1999. How do you feel that the man whose hands you raised in 1999 has become a problem to your party? It is true that I raised his hand, as shown in the photograph, after a free and fair primary in Jos on February 14, 1999. I have taken responsibility for everything because he was not qualified to run. He was not a candidate so to speak. The party's rule was that a candidate must win his ward, his local government, his constituency, and his state. But Obasanjo lost all that to the Alliance for Democracy. He lost even his polling booth to the AD. He stood no chance of becoming the presidential candidate of our party, but I pleaded with party chieftains that he was going to be a president of the entire Nigerian nation and that therefore, the entire country should be his constituency. I also reminded our party men that the Yoruba were still angry over the annulment of the June 12, 1993 election. But I did not know that he had no knowledge of politics. He was messing up just as he is messing up now in politics. But it was my fault. I thought he would learn and develop a political ear, develop a political brain, develop a political heart, develop a political sense of smelling and feeling. But unfortunately, he has not developed any of these five senses of human beings politically. So, do you regret foisting him on party members as a presidential candidate in 1999? Well, I will just have to apologise to the nation. I did not know that he was such a product. I meant very well for the country and I thought he was good. He disappointed me. I ask Nigerians to forgive me for making that mistake. But you will not blame him much. Now, at my age, I cannot go into the Army and claim to be either a good recruit or a general. I cannot handle the gun or do the type of training soldiers do. So, if I were him, I would have quietly withdrawn from politics because he is too old to develop democratic feelings. He has no time for democracy; anything that has to do with rule of law is waste of time to him. Obasanjo was a president in which you were well pleased. At what point did you fall out with him? We fell out when he wanted the constitution to be amended so he could enjoy a third tenure. I insisted that it was not right. And that was the same for which myself, and other Nigerians, the G18 and G36 fought the late General Sani Abacha. We did not want him to transform himself to a military president when he had not resigned his military commission. The Constitution provides for two terms of four years each. So, we could not tolerate a situation where he would change the constitution just to get a third term. He was not happy with my position and that was why he fell out with me. Our second point of disagreement was when he slammed a state of emergency on Plateau State. That, I will never forget. I will never forgive him. 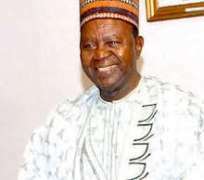 It was an insult on the people of Plateau State. It was the only state at the time that he found fit to slam a state of emergency on when there were more serious problems in Kaduna, Kano, Borno, Oyo and some other states. But because Plateau was a state he did not like, he slammed a state of emergency on it. Did the former president consult you on his third term bid? Did he ask you to support him? Yes, he did. But I said I was not going to support illegality. He did not come directly but he sent his agents. He could not come himself because he knew I do not support that kind of thing. I told his agents so and admonished them to advise him to drop the idea. I said he had done a lot for the country and should keep his good name. He did not like my stance on the matter and he promptly recalled my wife who was an ambassador. He instructed my wife to return home immediately. He noted that my wife was doing well but that because of my lack of support for his third term bid, she should return home. He did not stop there. He sacked my daughter who was a special assistant to him. But I thank God; that my daughter is now a member of the House of Representatives. Obasanjo also gave a directive that a parcel of land allocated to my wife for the building of a school in the Utako District should be revoked. The land was not allocated to my wife during his tenure. He revoked another land that was given to our family for mass housing development. He persecuted me for not supporting his third term bid. But I have no regret for not supporting him. What is your advice for your party members as they go into the convention? I wish everybody good luck. They are all members of the PDP. They should work hard to restore the good name of the party. Let them restore PDP to its glory in line with the dreams of the founding fathers. PDP was a party that everybody loved but now, there is bickering, quarrelling, blackmailing and so on. What Obasanjo did to Atiku, his deputy, was a shame. Nigerians gave them the most important offices in the land but Obasanjo rubbished the offices simply because he wanted a third term and Atiku failed to support him. Obasanjo introduced a party of exclusion. During the third term bid, he called for revalidation of party membership. In his effort to revalidate, he excluded those of us who did not support his third term bid. We were not re-registered. Those who will be elected at the convention should please restore peace and unity to the party. They should make PDP a rancour-free party. Will you be at the convention? Why not? I will be at the convention. And Obasanjo might just be sitting beside you? (Laughs) Well, he is a friend. Anytime, we meet, we greet. I regard him as a friend but some of his actions were wrong and he has to go before God to ask for forgiveness. The general feeling in the party is that he should step down as chairman of the BOT. Who are you supporting for the chairmanship of the party?